The seasons have shifted once more, the days have become longer and now it is time for the Litha celebration. The longest day of the year, the Summer Solstice. This is the time of year to celebrate the masculine half of the sacred energy that rules nature. 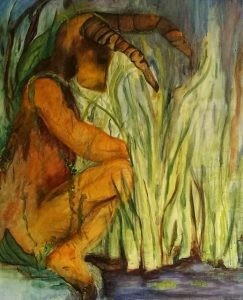 This energy is represented by a few deities, The Horned God, Ceronnous, Pan, Herne the Hunter, and the Green Man just to name a few. With his mighty horns he is the protector of the forest, the god of animals and vegetation. When he is in his Sun form he is the giver of life to the crops. He is the God of fertility, of ecstatic music and dance, and wild nature. He is born in the spring and spends his childhood and young adulthood in the forest as pan or the green man. Wild and free he runs, dances and plays his pipes. He falls in love with, and impregnates the Goddess. In the midsummer he becomes The Horned One in the prime of his life. When Autumn arrives it is time for the harvest. The crops that he fed all spring and summer with his life giving sunshine are harvested, the animals slaughtered, and The Horned One is sacrificed. His blood fertilizes the land for the next spring. The crops go dormant, and he travels to land of the dead, becoming the caretaker of the souls who have passed on. When spring arrives he is reborn as the child that is carried by the goddess. The cycle begins again. Make an infused oil or honey. put some olive oil in a clear jar, add some lemongrass, garlic rosemary whatever you like, and place in the sun for the day. For a delicious honey treat, use rose petals that are organic or you know have not been chemically treated and infuse them in some raw natural honey. Do an outdoor activity that brings you close to nature, kayaking swimming, nature walking. Whatever you decide to do, enjoy your midsummer day, the longest day of the year, have a Blessed Litha, a Merry Christmas, Happy Holiday, and a wwonderful New Year.